The Arizona Game and Fish Commission is soliciting nominations for the 2013 annual Commission Awards, recognizing individuals, organizations, foundations or government agencies who have contributed significantly to the conservation of the state's wildlife, its outdoor heritage, and the mission of the Arizona Game and Fish Department. The application deadline is Friday, Aug. 16, 2013. Employees of the Arizona Game and Fish Department are not eligible for nomination. The commission will select the 2013 award recipients at its Sept. 6-7, 2013 meeting. The awards will be presented at the annual Arizona Game and Fish Commission Awards Banquet set for Saturday, Jan. 11, 2014, at the Carefree Resort & Conference Center, 37220 Mule Train Road, Carefree, AZ 85377. Youth Environmentalist of the Year Award - Any individual, 18 years of age or younger, who has excelled in efforts that benefit wildlife and the mission of the Arizona Game and Fish Department. Outdoor Writer of the Year Award - Any professional or freelance writer who has excelled in highlighting issues or activities pertaining to the welfare of wildlife and the mission of the Arizona Game and Fish Department. Media of the Year Award - Any media source (radio, television, magazine, newsletter, or periodical) that has broadcast or published articles and/or materials about wildlife or wildlife related topics, which are beneficial to the public interest and the mission of the Arizona Game and Fish Department. Conservation Organization of the Year Award - Any organization, group, foundation, or agency that has excelled in efforts to enhance the welfare of wildlife, wildlife related recreation, and the mission of the Game and Fish Department. Conservationist of the Year Award - Any individual not associated with a professional agency who has excelled in efforts to enhance, conserve, and manage wildlife or their habitats. Natural Resource Professional of the Year Award - Any individual who, through a professional agency affiliation, has excelled in efforts to enhance, conserve and manage wildlife or their habitats. Volunteer of the Year Award - Any individual who, as a registered volunteer with the Department, has excelled in efforts to support and benefit the mission of the Arizona Game and Fish Department. Educator of the Year Award - Any individual whose educational activities have advanced and supported the welfare of wildlife, wildlife-related recreation, or the mission of the Arizona Game and Fish Department. Mentor of the Year Award - Any individual who has acted in the role of a mentor and whose efforts have resulted in the promotion and support of future wildlife conservation efforts and the development of future wildlife conservation leaders in Arizona. Advocate of the Year Award - Any individual who has engaged in political advocacy for the betterment of wildlife conservation and in the support of the mission of the Arizona Game and Fish Department. License Dealer of the Year Award - Any license dealer who actively promotes Game and Fish license and tag sales through innovative approaches, community involvement and a focus on customer service which benefits the citizens of Arizona and supports Game and Fish's mission of wildlife conservation. Buck Appleby Hunter Education Instructor of the Year Award - Any hunter education instructor who actively participates in hunter education activities and demonstrates the highest level of customer service, dedication and professionalism during these activities. Award of Excellence - Any individual, group, organization, club, foundation or agency that has excelled in efforts to benefit wildlife, wildlife habitats, or programs of the Arizoan Game and Fish Department. To submit a nomination, download a form at http://www.azgfd.gov/inside_azgfd/commission_awards.shtml. Return the completed form and all supplemental materials to: Arizona Game and Fish Department, DOHQ-Commission Awards, 5000 W. Carefree Highway, Phoenix, AZ 85086. Forms can also be e-mailed to LRoe@azgfd.gov or faxed to (623) 236-7299. 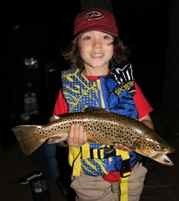 Arizona Fish Report: Trout fishing in Arizona is only picking up with monsoon activity.